In the popular imagination, the term robot evokes images of a mechanical device that looks and acts like a human being. 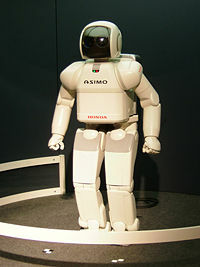 This type of robot, called a humanoid or android, is common in science fiction literature and cinema. In reality, the term robot can be applied to any of a wide range of programmable machines, the common feature of which is that they are capable of movement and can be used to perform physical tasks. Robots are built in many different forms, ranging from humanoid to industrial, and their appearance is dictated by the functions they are to perform. They are usefully engaged in industrial production requiring repetitive tasks, and in performing tasks that may be difficult or dangerous for humans. 1 What is a robot? Several concerns have been expressed about robots. One is that they can displace people from their jobs. Another is that humanoid robots, if they acquire intelligence and emotions that allow them to think and act on their own, may become hostile toward humans and threaten humankind. The latter concern, however, is based on fictional concepts. Real-world robots are machines with their own mechanical limitations, and they lack the human spirit. Although they may be built to simulate human intelligence and decision-making traits to some extent, these abilities are governed by artificially programmed feedback loops, not by creative thought processes, heartfelt feelings, and senses of responsibility—qualities that underlie human aspirations and freedom of expression. Consequently, the abilities, activities, and value of robots will remain distinct from those of humans. 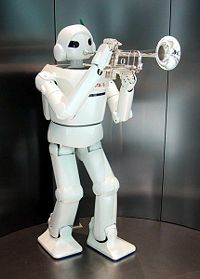 A humanoid robot manufactured by Toyota appears to be playing a trumpet. A robot is a machine that can perform preprogrammed physical tasks. Robots have been built to serve various functions, and they therefore appear in a variety of forms. Some robotic devices, such as the robotic arm of the space shuttle, act under direct human control. Other robots act autonomously, under the control of a computer. Certain robots, such as remotely controlled bomb-disposal units, are used to perform tasks that are too dangerous or difficult for humans to engage in directly. Others, including those used in automobile production, have made it possible to automate repetitive tasks, lowering the cost of performing them. Some robots may act according to their own decision-making ability, provided by the technology of artificial intelligence. Such robots include feedback loops such that they can interact with and respond to their environment. They do not, however, display actual intelligence. The idea of mechanical men and semi-intelligent mechanical devices stretches back to the legends of ancient civilizations. For instance, in classical Roman and Greek mythology, the god of fire and metalwork (Vulcan in Rome and Hephaestus in Greece) created mechanical servants ranging from intelligent, golden handmaidens to three-legged tables that moved about under their own power. Jewish legend tells of the Golem, a clay statue animated by Kabbalistic magic. Similarly, Norse mythology (in the Younger Edda) tells of a clay giant, Mökkurkálfi or Mistcalf, constructed to aid the troll Hrungnir in a duel with Thor, the god of thunder. Model of Leonardo da Vinci's mechanical knight, with a display of its inner workings. One of the first recorded designs of a humanoid robot was made by Leonardo da Vinci around 1495. Da Vinci's notebooks, rediscovered in the 1950s, contain detailed drawings of a mechanical knight that can sit up, wave its arms, and move its head and jaw. The design is thought to be based on his anatomical research recorded in the Vitruvian Man. It is not known whether he attempted to build the robot. In 1737, French engineer Jacques de Vaucanson made the first known functioning humanoid robot that played the tabor and pipe. He also made a mechanical duck that reportedly had more than 400 moving parts and could flap its wings, eat grain, drink, and defecate. Nikola Tesla invented a teleoperated boat, similar to a modern remotely operated vehicle (ROV), that was demonstrated at an 1898 exhibition in Madison Square Garden. Based on his patent for "teleautomation," he hoped to develop the "wireless torpedo" into an automated weapon system for the U.S. Navy. Between 1937 and 1938, Westinghouse made eight similar humanoid robots nicknamed Elektro, exhibited at the 1939 and 1940 World's Fairs. Each of these robots was about seven feet tall, weighed 300 pounds, and could walk, talk (using a 78-rpm record player), smoke cigarettes, and move its head and arms. In 1948 and 1949, W. Grey Walter at Bristol University, England, created the first electronic autonomous robots, named Elmer and Elsie. They were often described as tortoises, based on their shape and slow movements. These three-wheeled robots were capable of phototaxis (movement guided by the influence of light), by which they could find their way to a recharging station when they ran low on battery power. Robots have been frequently used as characters in works of literature. The word robot first appeared in the play R.U.R. (Rossum's Universal Robots), written by Czech writer Karel Čapek in 1920. In a short letter, Karel Čapek credited his brother, painter and writer Josef Čapek, for having coined the term robot. It is derived from robota, which means "compulsory labor" or "corvée" in the Czech language and "work" in Slovak; a robotnik is a peasant or serf. Science fiction writers have devoted many volumes to robots and their interaction with humans. Of particular note is the work of Isaac Asimov, who has centered a large portion of his work on robot-related stories. In his three "laws of robotics," he codified a simple set of behaviors for robots to remain at the service of their human creators. Literary works have adopted specialized terminology when referring to different types of robots. For instance, the term "robot" has come to mean a mechanical human, while "android" is used for an artificial human with organic parts, and "cyborg" or "bionic man" refers to a human form that contains both organic and mechanical parts. Organic artificial humans have also been referred to as "constructs." The term robotics refers to the technology that involves the design, manufacture, and uses of robots. Someone who works in the field of robotics is called a roboticist. This person requires a working knowledge of electronics, mechanics, and software. The word robotics was first used in print by Isaac Asimov in his science fiction short story “Liar!”. Although robots vary in appearance and capabilities, they share the features of a mechanical, movable structure under some form of control. Generally, a robot's structure acts like the skeleton of a body and is called a “kinematic chain.” The chain is formed of links (the robot's "bones"), actuators (the robot's "muscles"), and joints. In most contemporary robots, each link connects the one before it to the one after it. These structures often resemble the human arm. When a robot is needed to manipulate objects, the last link carries an "end effector," which can be anything from a mechanical hand to a welding device. A robot's mechanical structure needs to be controlled on various levels, so that the device can recognize patterns, move along certain paths, avoid obstacles, and perform various tasks. The control of these functions usually involves three phases: perception, processing, and action (robotic paradigms). The robot has sensors that pick up information about the environment or the robot itself, such as the position of its joints or its end effector. Using strategies from the field of control theory, this information is processed to calculate the appropriate signals that need to be sent to the actuators (motors), and these in turn move the mechanical structure. Complex and adaptable control strategies may be referred to as artificial intelligence. To perform any task, the robot needs the ability to move. When designing a robot, the roboticist needs to consider its motion in terms of (a) kinematics, or motion apart from the forces that cause the motion, and (b) dynamics, or motion in conjunction with the forces that affect it. The information gathered by studying the various possible motions can be used to improve the algorithms that control the robot's actions. KUKA Industrial robots assemble a vehicle underbody. As robots grow in number and complexity, they are being more widely used in industry. Most often, they are used to perform repetitive tasks. Industrial robots can be manufactured in a wide range of sizes and can therefore handle much larger tasks than a human can. In addition, robots are useful in environments that are unpleasant or dangerous for people to work in, such as in toxic waste cleanup, bomb disposal, mining, and working in outer space or deep water. Certain mobile robots, called automated guided vehicles (AGVs), are used in large facilities such as warehouses, hospitals, and container ports, for the transport of goods and for safety and security patrols. Such vehicles can be programmed to follow wires, markers, or laser guides to navigate around a given location. Some robots are available for performing domestic tasks such as cooking, vacuum cleaning, and lawn mowing. In addition, robot kits made of plastic or aluminum are becoming increasingly popular for education in schools and professional training by companies. Humanoid robots are being developed with the aim of providing robotic functions in a form that may increase their appeal to customers. These types of robots, known as social robots, are made to interact with and provide companionship to people. So far, the main use of robots has been in the automation of mass-production industries, where well-defined tasks must be repeated in exactly the same fashion, with little need for feedback to control the process. Typical applications of industrial robots include welding, painting, ironing, assembly, picking and placing, palletizing, product inspection, and testing. They can accomplish all these tasks with high endurance, speed, and precision. 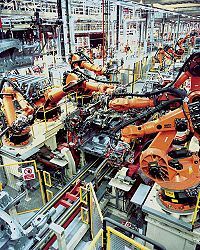 A prime example is automobile manufacture, in which large, complex robots are used. The International Organization for Standardization (ISO) has officially defined an industrial robot as an "automatically controlled, reprogrammable, multipurpose manipulator, programmable in three or more axes." Most industrial robots would fall in the category of robotic arms, as implied by the term "manipulator" in this definition. Industrial robots exhibit varying degrees of autonomy. Many are programmed to perform specific actions over and over again, without variation, and with a high degree of accuracy. Other industrial robots are built to be much more flexible about the orientation of the object on which they are operating or even the task that has to be performed, which the robot may need to identify. For example, these robots may contain machine vision subsystems acting as their "eyes," linked to powerful computers or controllers. Artificial intelligence, or what passes for it, is becoming an increasingly important factor in the modern industrial robot. A humanoid robot is a robot that is built to imitate the structure of the human body and to perform some of the same physical and mental tasks that humans can do. It is also built to function autonomously, in the sense of being able to adapt to changes in its environment or itself and continue to reach its goal. This is the main difference between humanoids and other types of robots, such as industrial robots, which perform tasks in highly structured environments. Consequently, humanoid robots are more complex than other kinds of robots and are more difficult to develop. The capacities of a humanoid robot may include (a) autonomous learning, that is, learning new capabilities and adapting to new situations without outside assistance; (b) self-maintenance, such as the ability to recharge its batteries; (c) interacting safely with humans and the environment; and (d) avoiding situations that could harm others or itself. To build and study humanoids, researchers need to understand the human body structure and behavior. Consequently, an important benefit of the work to develop humanoids is that it could lead to a better understanding of human biological and mental processes, from the seemingly simple act of walking to the concepts of consciousness and spirituality. Research into humanoids is valuable in the medical field, such as in efforts to construct realistic leg and forearm prosthetic devices for amputees, or devices that help straighten deformed limbs. In addition, humanoid robots are being developed to assist the sick and elderly, or to perform dirty or dangerous jobs. The long-term goal of the creators of humanoid robots is that someday these devices will be able to understand human intelligence, reason and act like humans, and work alongside humans. Humanoid robots are becoming increasingly popular in the realm of entertainment. For example, the female robot Ursula sings, dances, and speaks to her audiences at Universal Studios. Several Disney attractions employ the use of animatrons—robots that look, move, and speak like human beings—in some of their theme park shows. These animatrons look so realistic that it can be hard to decipher from a distance whether or not they are actually human. Despite their realistic appearance, they have no cognition or physical autonomy. It is extremely difficult to develop a robot that can move with a natural human or animal gait. One reason is that human and animal body movements involve a very large number of muscles, and replicating them mechanically is difficult, expensive, and requires a large amount of computational power. A major challenge in creating a bipedal robot is in getting it to keep its balance. Initial work has therefore focused on building multi-legged robots such as hexapods, which are statically stable and easier to work with. Robotic manipulators can be very precise, but only when a task can be fully described. Researchers are making progress in the area of feedback and tactile sensors, which give a robot the ability to sense its actions and adjust its behavior accordingly. This ability allows the robot to perform complex physical tasks that require some active control in response to the situation. Recently, regulatory approval was granted for the use of robots in minimally invasive medical procedures. Robots are also being considered for use in performing highly delicate, accurate surgery. In the future, a surgeon may use a remotely controlled robot to perform a procedure on a patient when the two are separated by a considerable distance. Experimental winged robots and other devices exploiting biomimicry are also in early development. By using so-called "nanomotors" and "smart wires," researchers are attempting to drastically simplify motive power. In addition, they are using extremely small gyroscopes to improve the robot's stability during flight. A significant driver of this work is military research into spy technologies. Various ideas have been advanced about the types of robots that will emerge in the future and how they will affect people materially and emotionally. Some scientists believe that in the first half of the twenty-first century, robots will be built to approximate humanlike intelligence. Whether or not that becomes a reality, it seems likely that robots will be increasingly used in homes and offices, replacing "dumb" appliances with "smart" robotic equivalents. Domestic robots capable of performing many household tasks may be greatly improved. In his book The Human Use of Human Beings first published in 1950, cybernetics pioneer Norbert Wiener discussed the issue of robots replacing humans in various fields of work. He speculated that robots taking over human jobs may initially lead to growing unemployment and social turmoil, but in the medium-term, it may increase the wealth of people in most nations. In 1970, Japanese roboticist Masahiro Mori postulated a principle called the "Uncanny Valley." He theorized that as a robot is made more humanlike in appearance and motion, people will respond with increasing empathy and positive emotion, until a point is reached at which the response suddenly becomes strongly repulsive. In his view, if the robot's appearance and motion are made indistinguishable from a human's, the emotional response will once again become positive, approaching human-human empathy levels. The repulsive response to an "almost human" robot was described as the "Uncanny Valley." Some roboticists have heavily criticized this theory. Occasionally, the same technologies may be useful in both robotics and medicine. For instance, artificial parts such as pacemakers are already being used to repair the human body. In this sense, there is some degree of convergence between humans and robots. Frankenstein (1818), sometimes called the first science fiction novel, has become synonymous with the theme of a robot or monster advancing beyond its creator. Since then, a wide range of books and films have expressed fears and concerns about robots, particularly humanoid robots. The principal theme is that they may acquire intelligence and abilities superior to those of humans, then break away from human command, develop the motivation to take over the world, and destroy the human race. These ideas have raised several additional concerns. For instance, who should be held responsible when an intelligent machine commits a crime, or does something it should not do? What would be the difference between the rights of humans and those of humanoids? If a robot were to produce its own inventions, who should the patent rights be awarded to? These concerns, however, are based on fictional concepts that circumvent the reality that robots are machines with their own mechanical limitations and devoid of the human spirit. Although robots may be built with abilities that simulate human intelligence and decision-making traits to some degree, these abilities depend on artificially programmed feedback loops, not on creative thinking, deep emotions, and responsible volition—qualities that drive human aspirations and freedom of expression. From this perspective, real-world robots cannot be expected to have their own motivations to commit crimes or to exert independent creativity and responsibility to produce beneficial inventions. One may infer that the abilities, activities, and value of robots will continue to remain apart from those of humans. A more realistic concern is that when robots are used to perform tasks usually done by human beings, they may displace people from their jobs, such as in factories. This issue requires solutions that are sensitive to people's needs. One possible danger may take the form of harmful programming or unsafe use of robots. Even without such programming, a robot that moves freely in a human environment is potentially dangerous because of its large moving mass, powerful actuators, and unpredictably complex behavior. A robot that accidentally falls on someone or even steps on a person's foot could injure the victim far more than another human of the same size. Most industrial robots are therefore confined within a protective fence that separates them from human workers. Designing and programming robots to be intrinsically safe, and to exhibit safe behavior in a human environment, is one of the great challenges in robotics. Competitions for robots are gaining popularity and cater to a wide variety of robot builders, ranging from students in schools to professionals in research institutions. The robots are made to compete in a wide range of skills, including combat, game playing, maze solving, performing tasks, and navigational exercises. Dean Kamen, Founder of FIRST (For Inspiration and Recognition of Science and Technology), has created the world's leading robotics competitions for students in elementary, middle, and high schools. This highly competitive, multinational program teams professionals and young people to solve an engineering design problem, including the creation of autonomous and driver-controlled robots. Four competitions have been set up for students in four different age groups. RoboCup is an international competition dedicated to developing a team of fully autonomous, humanoid robots that can win against the human world soccer championship team by the year 2050. The underlying aim is to promote research and education in the field of artificial intelligence. RoboCup Junior is a similar competition set up for school-aged students. All robots are designed and developed solely by the students and act autonomously, without any form of remote control or human intervention. The DARPA Grand Challenge is a competition for robotic vehicles to complete an under-200 mile, off-road course in the Mojave Desert. The unclaimed 2004 prize was $1,000,000. The farthest any participant got was only 7.4 miles. However, the 2005 prize of $2,000,000 was claimed by Stanford University. In this race, four vehicles successfully completed the race. This is a testament to how fast robotic vision and navigation are improving. The Intelligent Ground Vehicle Competition () is an annual event for university students who are expected to construct autonomous ground vehicles that traverse outdoor obstacle courses without any human interaction. This international competition is sponsored by the Association for Unmanned Vehicle Systems International. The American Association for Artificial Intelligence sponsors two Grand Challenges focusing on human-robot interactions. In addition, NASA holds the Centennial Challenges for non-government funded technological achievements, including robotics. In Micromouse competitions, small robots try to solve a maze in the fastest time. ↑ 1.0 1.1 Dennis G. Jerz, R.U.R. (Rossum's Universal Robots). Retrieved October 18, 2011. ↑ Dominik Zunt, Who did actually invent the word "robot" and what does it mean?, Karel Capek website. Retrieved October 18, 2011. ↑ Isaac Asimov, I, Robot (New York, NY: Bantam Spectra, 2008 (original 1950), ISBN 978-0553382563). ↑ According to the Oxford English Dictionary, the term "robotics" was first used in the short story "Liar!" published in the May, 1941 issue of Astounding Science Fiction. ↑ Associated Press, Courier robots get traction in hospitals, CNN.com (July 6, 2004). Retrieved October 18, 2011. ↑ Norbert Wiener, The Human Use of Human Beings (Cambridge, MA: Da Capo Press, 1988 (original 1950), ISBN 978-0306803208). ↑ The 19th Annual Intelligent Ground Vehicle Competition Retrieved October 18, 2011. ↑ AUVSI Retrieved October 18, 2011. EURON: the European Robotics Research Network which currently assembles over 150 robotics research institutes and robotics companies in Europe. SeattleRobotics.org – The Seattle Robotics Society, one of the oldest and largest hobby robotics groups in the world. GoRobotics.net Robotics resource website - robot news, projects, books, and club listings. Cal Poly Robotics Club – Site includes project descriptions, tutorials, and development tools. Robotics India Robotics India – A large and active community of roboteers from India. Site includes tutorials, articles, event coverage, and a host of other resources. Robot Platform Site dedicated to share knowledge about robots and electronics, and enjoy some serious fun. Industrial Automation Robots – RobotWorx is a turnkey integrator of new and refurbished robotic systems with emphasis on industrial automation and other robot applications. This page was last modified on 15 July 2015, at 16:31.